← The Commons as the Missing Piece? I find people highly compelling. I love biographies. I love looking at actual facebooks with pages and pages of photos of people with short descriptions of what they do and who they are. 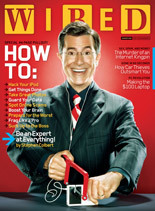 Wired has super glossy, close-up photos of personalities and Esquire does “What I’ve Learned” features overlayed on one staged photo of that person. I think it’s interesting to find new people and see what their histories are, where they came from, what decisions they made to get them to a certain point. Some sort of mix of their own view of their development, and outsiders’ views of them. Few things drive me more nuts than people online who hide their biographical data. Are they ashamed or embarrassed by what they’ve done? How can you read someone without context? There are a lot of bloggers who don’t include a simple About page so you can know who they are and what they do. Facebook came out of the Harvard facebooks, but it works substantially different now. There’s no facebook-like page with lots of portraits on them. Some of that grand appreciation of humans disappears — Facebook seems less about people and more about interfacing with a web platform or with a dissociated computer. And it would also be nice to see a brief 5-10 second video of that person moving or saying something, to add more context. Something brief, something well-integrated. 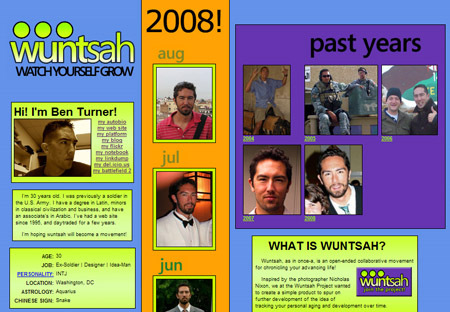 A little while back, I created a Wuntsah template. It’s intended to be a photo of yourself over regular intervals of time — in my case, once a (or wuntsah) month. I think it’s a great thing to do over time but it needs to be codified into a successful project and then made easily portable. Read more about where it came from and how it looks. You can even install it! I am tinkering with an idea to take my Canon PowerShot (on loan from my mother) and take short videos of my classmates and then put them up somewhere (maybe Flickr). I just want to experiment with it, and have something to remember them by after we graduate. Some cool stuff might come out of it. Maybe Galapag.us will have something like it. I’ve already decided to try to hire a freelance artist with a stunning, unique style, to draw portraits for paying subscribers.